A lens treatment is a special additive that either bonds with the lens, or is built into the lens during the lens manufacturing process. Lens treatments are available as individual additions to lenses, and are also commonly bundled into single lens products for convenience and maximum benefit to your eyes. 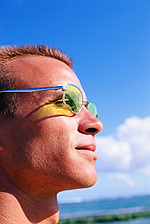 The UV rays in sunlight can be harmful to the eyes. Lenses that block 100% UV help to ward off various eye conditions and damage. Scratches on lenses are distracting, plain and simple. And they can interfere with lens performance. Scratch-resistant treatments imbued into the lens surface toughen up the lenses making them more durable. For fashion, comfort and clarity anti-reflective treatments are the way to go. They make the lens nearly invisible, and cut glare from headlights, computer screens and harsh lighting.